Each box contains 36 packs. Each pack contains 16 cards. 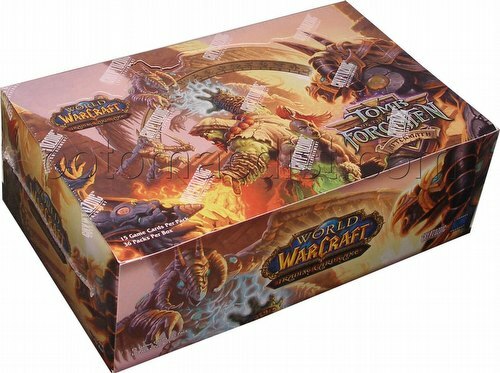 Each World of Warcraft Aftermath: Tomb of the Forgotten booster pack includes 16 cards - 15 game cards (10 common, 4 uncommon, 1 rare or epic) and 1 hero or crafting/token card. Loot cards are randomly inserted in packs and replace the hero/crafting/token card. There are 3 different Loot cards - the common Sand Scarab, uncommon Spurious Sarcophagus, and rare White Camel. There are 208 cards in the Tomb of the Forgotten set (70 common, 60 uncommon, 8 hero, 60 rare, and 10 epic). Tomb of the Forgotten introduces a new Monster race - Tol'vir, including three new Monster Heroes: Paladin, Priest, and Rogue. Tol'vir are the featured Monster race. The set also includes new Murloc, Ogre, and Demon allies.